Instead of developing a custom browser engine, Epiphany originally used Mozilla Gecko until version 2.28, but starting with version 2.20 in September 2007, it is using WebKitGTK. This change allows the relatively small developer community to maintain a sufficient level of modern web standards support. The features of GNOME Web include reuse of GNOME configuration settings, smart bookmarks and web application integration into user desktop. ^ "Contributors · GNOME / Epiphany · GitLab". gitlab.gnome.org. Retrieved March 15, 2017. ^ Canonical Ltd (April 22, 2016). 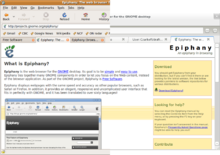 "epiphany-browser package in Ubuntu". Retrieved May 20, 2016.